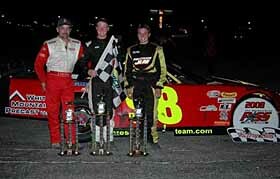 On a Saturday afternoon in May, 2007, a young driver from Western New Hampshire showed up at Maine's Beech Ridge Motor Speedway (ME) as part of the tough PASS North “Rookie Class of '07”. Adam Bates had been racing Late Models at Twin State Speedway successfully, but found his introduction to the touring ranks to be a challenge at best. He got bounced around during his heat race and ended the day with a wrecked racecar and a DNQ. Nobody would have blamed him for just giving up at that point. But Bates and his team didn't give up. Not by a long shot. They fixed the car and towed even further north the next day to Speedway 95 near Bangor, Maine. Then, in his first ever actual PASS North start, Bates turned heads by finishing ninth. From there, the team kept gaining experience and getting better, winning heat races and posting solid finishes. Saturday night at Beech Ridge, their effort came full circle as Bates recorded his first PASS North feature victory - exactly 14 months to the day after his first taste of the track - 14 months that seemed like ages. “It felt like forever,” said Bates of his time waiting for victory number one. Bates might have had some time to prepare for that victorious moment, but the feeling of actually winning a race still hit him hard. young guns Derek Ramstrom and D.J. Shaw before leading the all-important 150th and final lap of the event. Those other three drivers all made Bates work for the lead, but all three had different reasons for not catching him at the end. Ramstrom had a driveline failure surface on a late restart and he was eliminated from the race on the spot. Chubbuck spun his tires on the final restart. Shaw raced hard, but clean, and couldn't quite catch Bates as the laps wound down. Meanwhile, Bates paced himself perfectly. 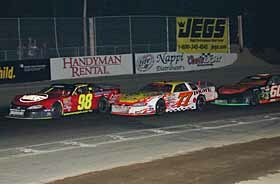 The final test for Bates came on lap 141 restart, that is when he lined up next to Chubbuck for the final time. The green flag waved and Bates went, but Chubbuck didn't. bump and run move wasn't on the menu for that young racer. “I didn't think I could catch him [Bates] and then Chubbuck spun the tires,” said Shaw. his first experience at the track wasn't that great but after that things got better quickly. sidelined him. At the 2008 season-opener, he finished a then-career best fourth. Bates knew he'd be good this time around at the Ridge as well, but he didn't necessarily predict a victory either. While a new face appeared in victory lane, several familiar ones to PASS fans didn't have such good days. Ben Rowe, who led the point standings heading into the night, saw his #4 Super Late Model get towed in by two wreckers after hitting the backstretch wall hard. Contact between Rowe and Richie Dearborn was the cause, although both drivers had differing opinions on who was to blame (we'll have more in our upcoming Beech Ridge leftovers). Johnny Clark and Travis Benjamin struggled with handling issues all night long. Cassius Clark and Mike Rowe made contact late in the race, with Clark finishing eighth and Rowe being penalized back to ninth for rough driving. Dearborn eventually dropped out of the race with an oil leak. Hometown racer Kelly Moore and Beech Ridge track champion Bib Bilodeau were both eliminated in a first lap wreck. Better luck on any of those drivers' parts probably wouldn't have changed the results much though. Of those drivers, only Cassius Clark ran in the top three at any point in the race. Meanwhile, a trio of Beech Ridge regulars stacked up well against their touring competition. Finishing behind Bates, Shaw and Chubbuck were track regulars Bill Rodgers, Aaron Ricker and David Oliver. Recent PASS South race winner and former Beech Ridge regular Trevor Sanborn placed seventh. 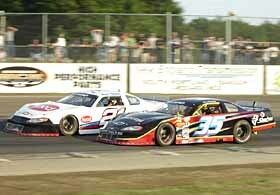 The PASS North Super Late Models return to action on Saturday, July 12th at Thompson International Speedway (CT).